Shopping garage sales has always been a popular weekend activity, but in these days of environmental awareness it's become downright chic! 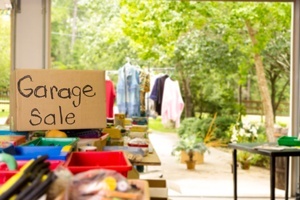 Score some super bargains with these expert tips for shopping garage sales like a pro. You no longer have to waste precious shopping time circling unfamiliar neighborhoods. Not only do you have GPS at your fingertips with your smartphone, Google Maps and MapQuest let you plot multiple addresses for the most efficient route. There are devices that allow sellers to scan credit and debit cards on their smartphone, but they're still rare on the garage sale circuit. Make sure you have plenty of cash, preferably with a large number of smaller bills. Did you spot the perfect coffee table, but you're not sure if it will fit your space? Assemble a "tool kit" with measuring tape, flashlight, fabric swatches and other accessories that will come in handy for evaluating potential purchases. Garage sales draw a faceless mass of humanity that shuffles in and out of the area. When you take time to smile and say hello, and maybe even indulge in a bit of small talk, it could make a positive difference once it's time to get down to business. 6. Is the Price Right? Whether you refer to it as "negotiating" or "haggling," striking a deal on the price is the favorite part of the process for many people. Here are some tried-and-true techniques for coming out a winner. Few prices are set in stone, but if a seller clearly doesn't want to negotiate, don't force the issue. Don't make negative comments about the merchandise, or claim that you can get it cheaper down the street. Such tactics usually backfire spectacularly. The first couple of hours are generally poor for negotiating, as sellers are using that time to assess the market. If you have your heart set on an item but couldn't come to terms on a price, swing back near the end of the day when tired sellers have lower resistance. While kids and pets love being outdoors, garage sales are not a recommended family activity. It's tough to focus on the matter at hand when you're busy corralling curious toddlers and energetic dogs. Are you a wise veteran of garage sale wars? Share your favorite tips with us in the comments!